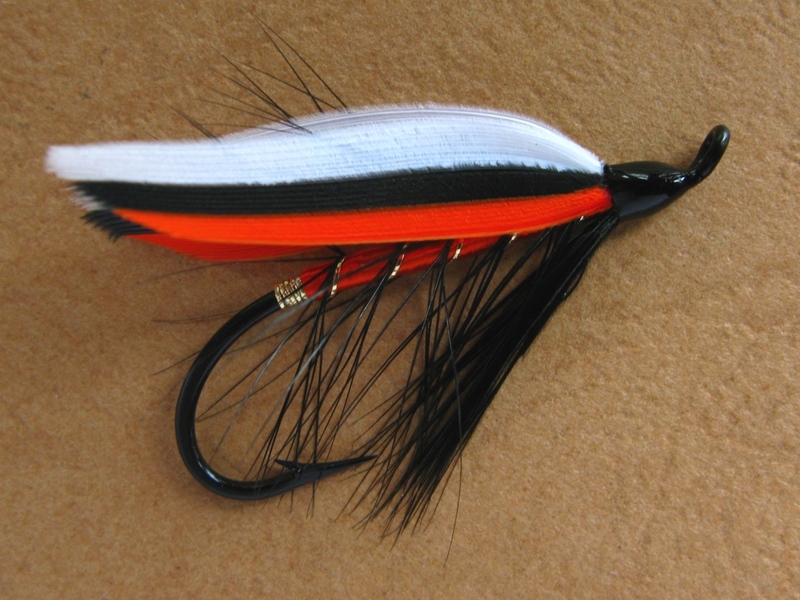 Brook Fin Wet Fly, my version with the added tag and rib, on a Mustad 36890 size #2 salmon hook. I first learned of the Brook Fin wet fly while in ninth or tenth grade through the color plates of a book titled, The Complete Book of Freshwater Fishing by P. Allen Parsons. It was illustrated there with other wet flies, drys, streamers, bucktails, and nymphs. The same paintings were originally published in H. J. Noll’s Guide to Trout Flies and How to Tie Them. I did not possess a copy of Noll’s book until the late 1990’s. Other than the Fontinalis Fin and Bergman Fontinalis, the Brook Fin was just the third brook trout fin wet fly pattern I had even seen. The Parson’s book lacked tying recipes, so my brother and I were tying many of those patterns solely by interpreting the illustration. In some cases this involved our best guess. At any rate, the reason for this batch of flies is because one of my customers to whom I had sent a few orders of fancy wet flies and Gray Ghosts for fishing in the Adirondacks, had made a September trip to the Salmon River in New York. While there, using a #6 Brook Fin wet fly I had tied on a Mustad 3399 hook, he suddenly saw a huge, dark shadow trailing his fly. As it came closer he saw that it was a very large Chinook salmon. He saw the fish actually strike and take the fly, at which point the fight was on. He played the fish for over fifteen minutes until the line went slack. Inspecting the hook, he discovered it was still attached, but had been bent open enough to lose its purchase in the fish’s jaw. He and his companions estimated the size of this fish at around 25 – 30 pounds. He e-mailed me to say that he wanted more, and wondered about getting some of these flies on stouter hooks. The flies on these Mustad 36890 size #2 irons are the end result. 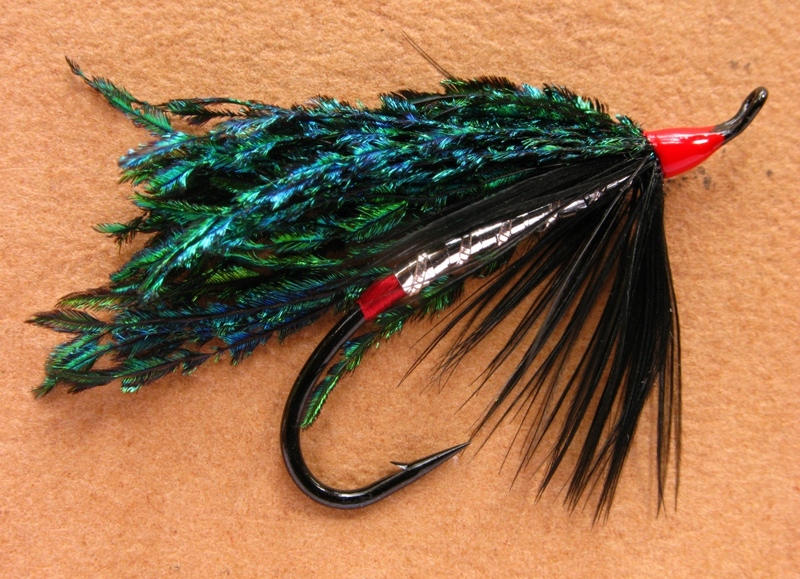 Somewhere along the line, I inadvertently stopped including the tail of black hackle fibers on the brook fin, probably because I started tying the pattern from memory and hadn’t checked the photo for some time; I simply forgot to include it. The addition of the oval gold tinsel tag and rib is added to strengthen the rear of the floss body and also to protect the stem of the palmered black hackle. I love the added accoutrement of the gold tag and rib. 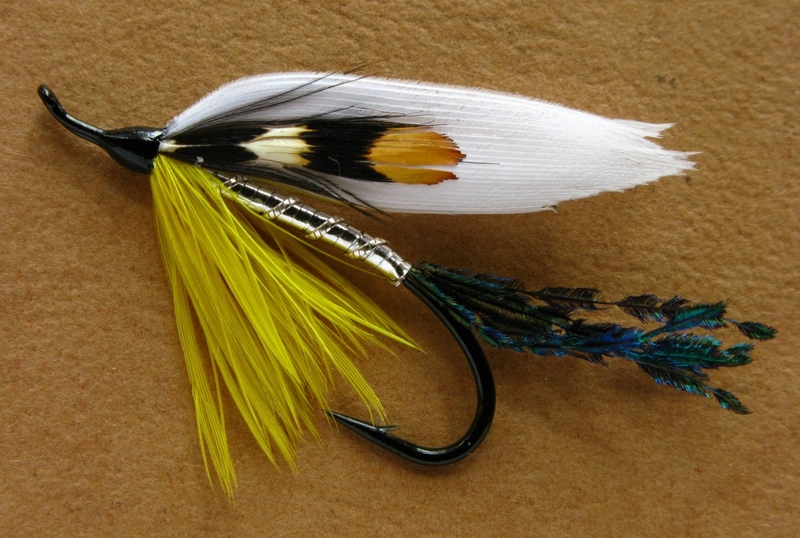 I had never dressed traditional trout flies on salmon hooks before, but for bigger fish, it makes perfect sense. I really like the appearance of these patterns on the black, up-eye salmon hook. 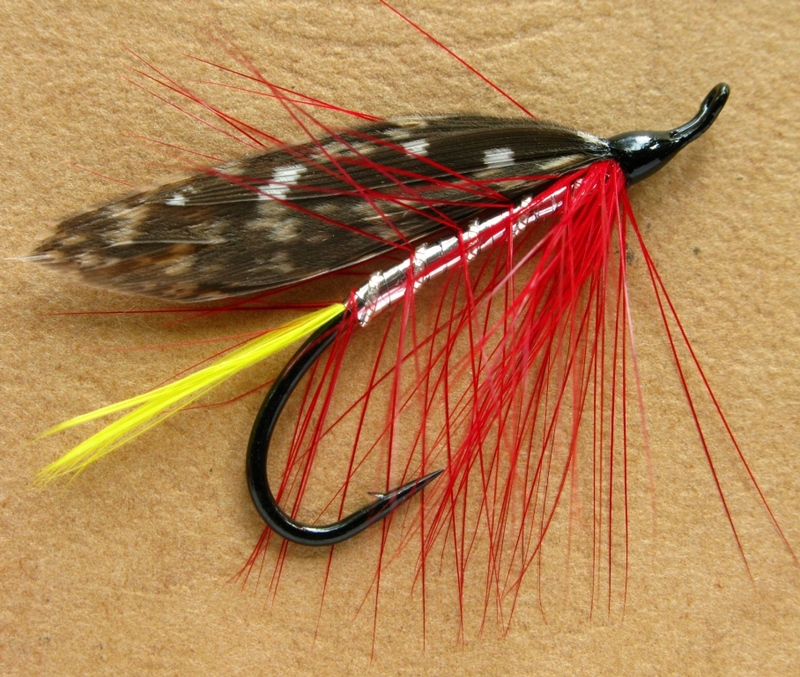 These flies are certain to work for steelhead, lake-run salmon, and perhaps even a few big browns that visit the Lake Ontario tributaries in the fall of the year. I also tied six other patterns on size #4 salmon hooks, the Alexandra, Golden Duke, Neverwas, Cupsuptic, Golden Doctor, and Dr. Burke. These additional photos and their recipes will be added to this topic later today. Neverwas (sorry about that one stray hackle barb, I was in a hurry and took only this one photo before shipping the flies to my customer). These six patterns were dressed on Dai-Riki 899 salmon / steelhead hooks and have a more aesthetically pleasing bend, and the wire diameter is finer, the return loop is tapered, and they are chemically sharpened, overall a better hook than the vintage 36890 Mustad’s I used on the Brook Fins. This entry was posted in Fish Stories and Other Tales, Fly Pattern Recipes, Wet Fly Photos. Thank you Dan, I appreciate your compliment! REALLY GREAT.. Hope I can do as well some day. Thank you very much Bob! Keep tying & one day you will! Don, you knocked these right out of the park. Absolutely stunning work. Thank you very much Kelly! I appreciate your compliment! Great flies as always! Your posts and new ideas are always an inspiration to get to work tying. 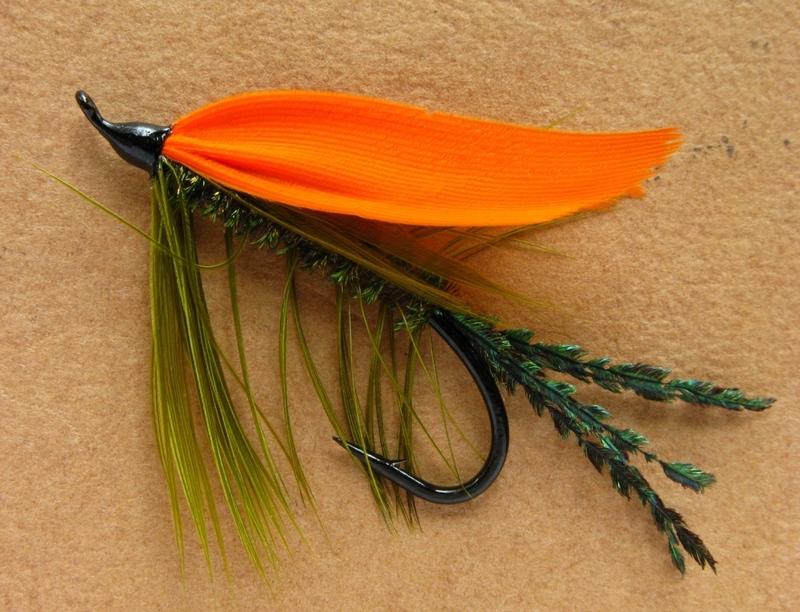 I used the last of my orange quills to tie the Brook Fin on the 3399’s, so I’ll have to wait to try my hand at these. Is the orange floss Danville’s Burnt Orange? Can’t wait to see the others especially the Alexandra. Thanks Again! Thank you for your kind words. I am glad you like the flies. Yes the floss is Danville’s Burnt Orange as they name it, I like it better for most of my wets what their other lighter shade is for orange floss. Thanks for your reply & compliments! The floss is Danville’s burnt orange, which to me is more orange. Hi Don. Those are neat looking. Where did you find hackle that large for the wings? Thanks for your compliment! By ‘hackle for the wings’ in your question, I think you mean “quills?” If so, it’s goose wing quill. Larger, longer barbs, though on a couple of the flies I had to use some really large duck quills I had because I ran out of orange goose. Thanks Norm, nice to hear from you! Appreciate your compliment. Thanks Norm, glad you liked them…! Excellent stuff, both the dressings and the photos. I’m certain that customer will be delighted. from the black hook and head make the colors of the fur and feathers just POP!… like 3D! Thank you Dave, appreciate your compliments and comments! This is a great looking set Don! Reminds me of the early steelhead flies. They look amazing for #2 hooks! These are spectacular! Can’t wait to sit down at the vice and give a few of them a try. Thanks for your beautiful work!! Hi Don. Beautiful ties. 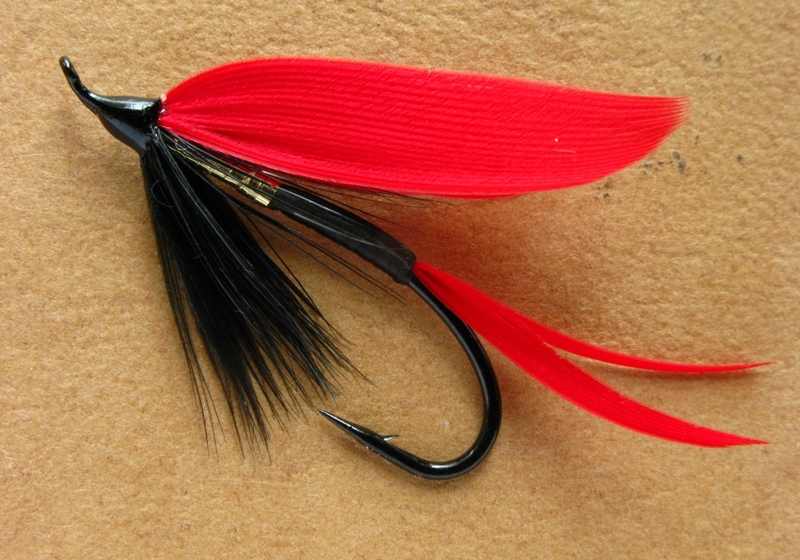 Where do you find wing quills large enough for tying size 2s, the Brook Fin? Do you use goose quills? 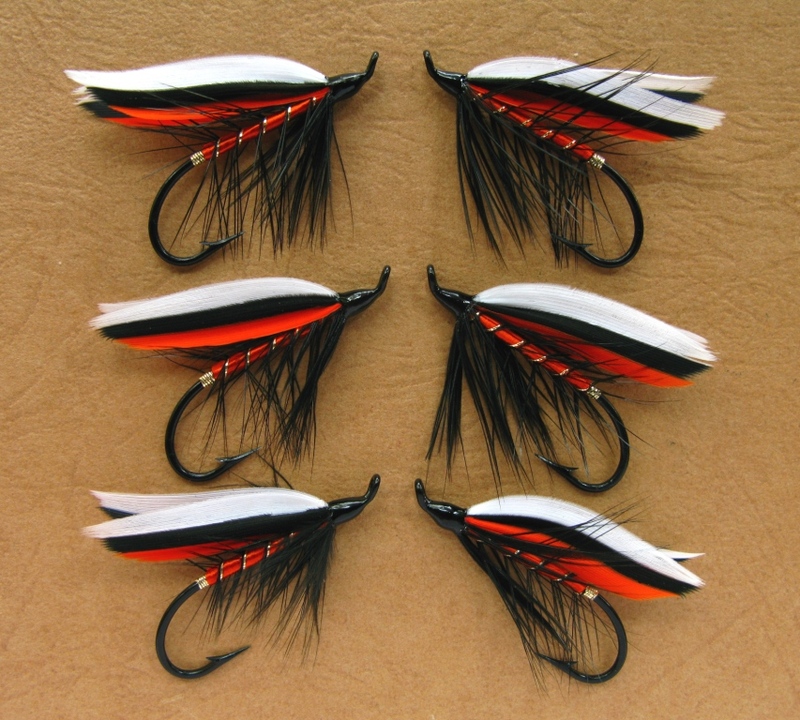 I have trouble finding enough duck quills to tie size 8s. Thanks Darren, Steve, and Bruce. Appreciate your comments guys! The quills for these larger flies are goose quills. Though once in a while domestic duck feathers render some #4 wet fly wings. Everyone, on a fishing note, my customer has reported back to me that he hooked and landed a very nice Salmon River steelhead on the Neverwas, the orange wing fly. I’m not the least bit surprised! Also, I have been in contact with MyFlies.com. I just need to send her out some samples. 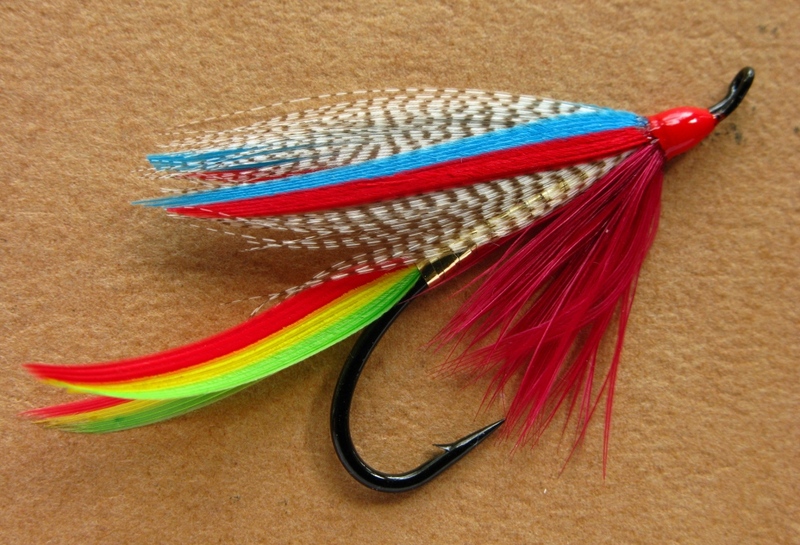 I have just been extremely busy tying lately. I’ve sold 1023 flies in the last month. Thanks for your comment! Thank you especially for your compliments on my flies, but even more so for your remark about me being “inspiring” to you. I appreciate that very much! The old Bergman color plates are cool to look at, but as you noted, they leave a little to be desired, especially in this age of digital photos, macros, etc. I checked out your flies on your fb page, very nice! Well tied, and I see (based on my commercial tying experience), from the diversity and consistency of your work that you are a good tier. Good work! Thanks again for your comment and compliments!